If you have played the game Second Life, you must have seen how it allows users to create virtual avatars of themselves, through which one can explore the world (known as the grid), interact with other avatars, socialize and indulge in different individual and group activities. Or imagine the Metaverse, a collective virtual reality (VR) created by author Neal Stephenson in his 1992 scifi classic Snow Crash, where user-controlled avatars could hang out in 3D bars and nightclubs, meet people, conduct business, and socialize. ‘Imagine being able to sit in front of a campfire and hang out with friends anytime you want. Or being able to watch a movie in a private theater with your friends anytime you want. Imagine holding a group meeting or event anywhere in the world that you want. All these things are going to be possible. And that’s why Facebook is investing so much early on in virtual reality. So we can hope to deliver these types of social experiences,’ said Zuckerberg. Back in 2014, Facebook acquired Oculus VR for around $2bn. The social media firm, which has been selling Gear VR- the mobile virtual reality device developed by Samsung (NASDAQ: SSNLF) and Oculus for $99, will offer the device for free on preorders of the Galaxy S7 and Galaxy S7 edge. It is also gearing up for the launch of the Oculus Rift headset by forming new teams to build the next generation of social apps in VR. According to Zuckerberg, hundreds of new titles (including Minecraft) will be available in the Oculus store later in 2016. 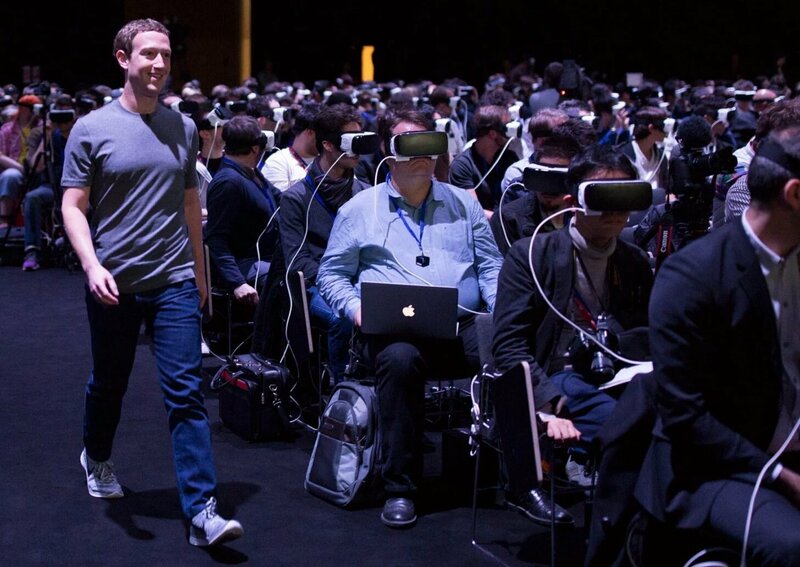 Zuckerberg’s vision- a scary dystopian future or great potential for VR? Just look at the image below. This looks straight from a dystopian sci-fi movie, where a billionaire dictator has enslaved humans, who are tethered to machines and are way too distracted by the virtual fantasies offered to focus on the real world. Moreover, Facebook’s rapacious desire to consume personal information is quite unnerving for many people, who still value their privacy above every other thing. Lest I sound like a prophet of doom, there is a lot of optimism also, especially regarding advancements in virtual reality technology, since it is now supported by a rich and powerful corporation. Over the last decade, VR has been majorly driven by the video game industry, with strong demand for high-end 3D graphics hardware found in gaming PCs and consoles. But high-end graphics cards are becoming more commonplace and several other tech giants are now investing in VR. In October 2014, Google led a $500mn investment in augmented-reality startup Magic Leap, while in January 2015, Microsoft launched its own augmented reality headset- the Hololens. Google has already seen astonishing success with its Cardboard, through which you can convert your smartphone into a VR device by simply inserting it into a cardboard headset. And now reports suggest that Apple is pretty much doing the same. ‘This is a thing that people were laughing at two years ago,’ says Zuckerberg. At present, VR is still in the nascent stage and is a technology which needs to be implemented in a way that is not only cost-effective but which can also be widely accepted by consumers (given the criticism faced by Google Glass regarding violation of privacy and security issues). The potential is great and if you think long-term- applications in education, gaming, entertainment, then the future is positively bright. amzing inn support of me.